Private jet charters to Ibiza, the party capital of the Mediterranean and a popular holiday destination. Chartering a private jet to Ibiza Airport (LEIB, IBZ) is the best way to get to and from the Balearic Islands, and our team offers the highest standards in executive and leisure air travel. Air Charter Advisors offers private jet charter flights to Ibiza, and with access to thousands of private aircraft around the world, we’re confident we can arrange the right aircraft for your trip. When working with us, you will receive an all-inclusive and customized booking experience that far-surpasses industry standards. One of our Ibiza Air Charter Advisors brokers will be available to you 24/7, as will their experience and knowledge. This means you don’t have to worry about anything, whether it be ground transportation or logistics issues. Our number one priority will always be client safety, and we do a number of things to keep our standards up-to-date, and stringent. Our private jet charter company is Wyvern certified, and we only work with FAR Part-135 (or foreign equivalent) aircraft operators for every charter flight, using only veteran pilots with a wealth of experience. Enjoy the peace of mind, comfort, and confidence that comes from working with a private jet charter broker that you can trust, and Air Charter Advisors will become your comprehensive aviation solution for luxury air travel, aircraft acquisition and private jet management in Spain. Request a quote now, or give us a call to book your luxury private plane to Ibiza, Spain. Our team is ready to help with all of your private aviation needs – consider our Ibiza Air Charter Advisors your private aviation solution in the Balearic Islands. The Balearic Islands are home to two major airports for private jet charter service. 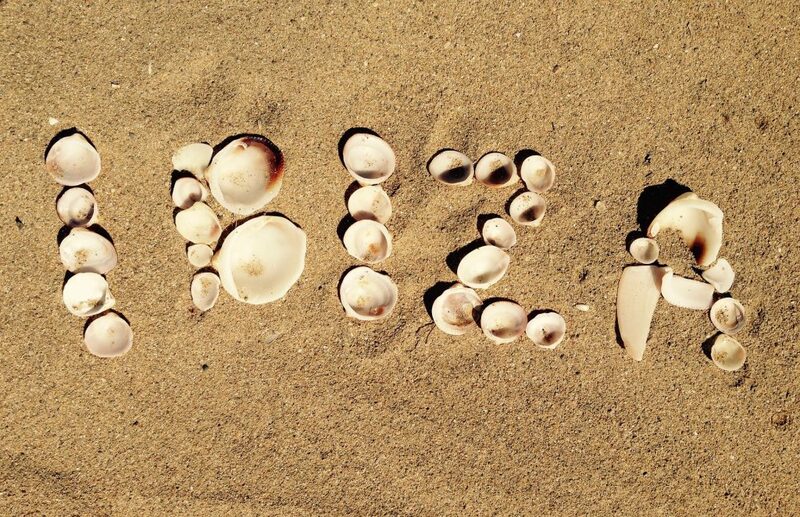 If you’re planning to head directly to the island, (IBZ) Ibiza Airport will be your only arrival option. Clients may also choose to land at airports on the neighboring island of Mallorca, and charter a luxury yacht to captain their own voyage across the Balearic Islands. You can also choose to fly into Valencia, the closet major city on mainland Spain. Charter a private jet to Ibiza, party capital of the Mediterranean. Whether flying private for business or leisure, we can help arrange the right aircraft and flight itinerary that best meets your needs. Spring breakers and summer vacationers visit the island for its vibrant atmosphere and tropical climate, and many of the world’s top DJs establish residency at local nightclubs for the summer season. Air Charter Advisors believes in providing private flyers with a one-on-one consultative service experience that exceeds every expectation. We understand that your time, privacy, flight preferences and most of all, safety, are all extremely important. Our Ibiza Jet Charter representatives are available for you by phone and email 24 hours a day, 7 days a week. When using our private aviation service, you can expect quick response times and an easy, hassle-free booking process. Request a quote or call us to arrange your private flight to Ibiza, Spain. 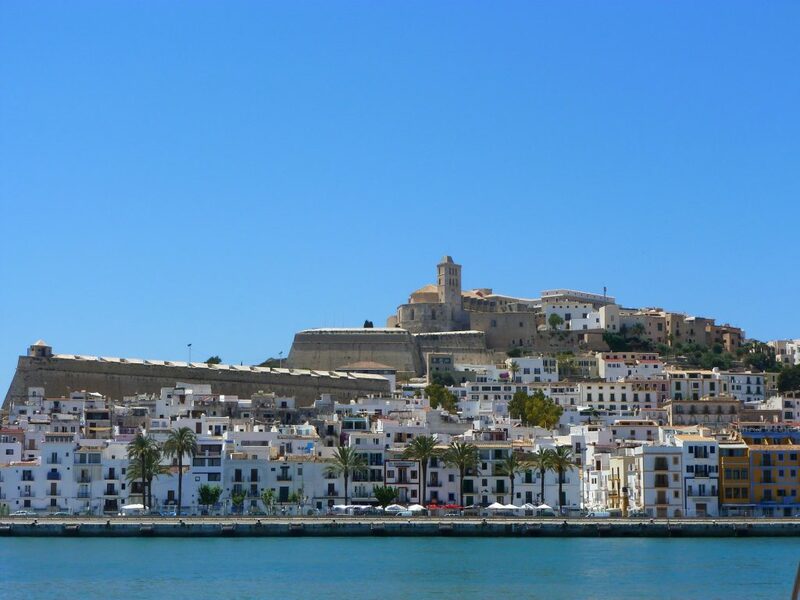 Charter a private flight to Ibiza, party capital of the Balearic Islands. Located in the Mediterranean just east of mainland Spain, the island is a premier destination for party-goers and music lovers. Whether you’re checking out one of the many music festivals held on their island or you’re a performer looking to transport your crew and equipment, our jet charter experts can arrange the perfect flight to get you to the island in time for the show. Private flights to Ibiza spike from May to October as the nightclub scene explodes into action. Check out more of our recommendations after your private flight to Ibiza, Spain. The smallest of the Balearic islands, Formentera is known for its crystal-clear waters and endless stretches of beach framed by dunes and pine trees. Formentera is a popular day-trip destination from Ibiza in the summertime, and it’s easily reachable with a half-hour ferry ride. Some of the activities you can enjoy while on Formentera include snorkeling and sailing, with equipment and boat rentals available. If you’re interested in chartering a private luxury yacht during your visit, let us know! Our jet charter team can connect you with the right luxury yacht so you and guests can freely sail between Formentera and Ibiza. Ibiza holds a reputation of mystery and legend, and one of the main reasons why is its rocky landmark island, Es Vedrà. Standing nearly 400m tall and sitting just off the western coast in the Cala d’Hort, this uninhabited limestone island is said to be the third most magnetic spot on Earth after the North Pole and Bermuda Triangle. Myths regarding the island range anywhere from it serving as the home to sirens and sea-nymphs as they attempted to lure Ulysses during his Odyssey, to parts of the island being used by Egyptians to build their pyramids, to the islands being the tip of the lost city of Atlantis – pay a visit to the natural cave of Atlantis directly opposite Es Vedra if you’re up for the challenge. Also known as Sa Talaia or Sa Talaia de Sant Josep, Sa Talaiassa is the highest peak on the island, standing at 475m as it looks over the south of the island. The name is derived from the Catalan word for watchtower, and the island’s largest municipality is named after the mountain. Drive the road to Cala Vedella or hike a trail from Sant Josep village to the summit for amazing views over the island. It’s the perfect photo-spot during your trip and a great place to catch a sunrise or sunset, or to take a break from the four-on-the-floor beat that keeps reverberating through your head from the night before. Private jet travelers will have over 80 stunning beaches to choose from when they’re not busy bouncing from club to club. Take a break from the action and get away from the crowds, or maybe you’re after some peace and quiet to begin with. Either way, you can sit back and unwind after your private flight at one of our top choices from the following list. From the rocky pools and shady Sabina trees of Cala Bossa and the beach bars at San Antonio, to the gently-sloping sands of Aigua Blanques where beach-goes can bare all, Ibiza offers private jet travelers over 80 beaches to choose from after their charter flight arrives at (LEIB, IBZ) Ibiza Airport. Here’s a list of our favorite beaches recommended by our private jet charter clientele. Ibiza’s longest beach at just about 3 kilometers long, Playa d’en Bossa is one of the most famous beaches on the island. Sun-seekers cover the pale-sands during the summer, and the high tourist demand has resulted in an array of beach bars, cafes and restaurants to take a break at. The promenade is a great place to people watch, and DJs are often spinning along the beach until nightfall. 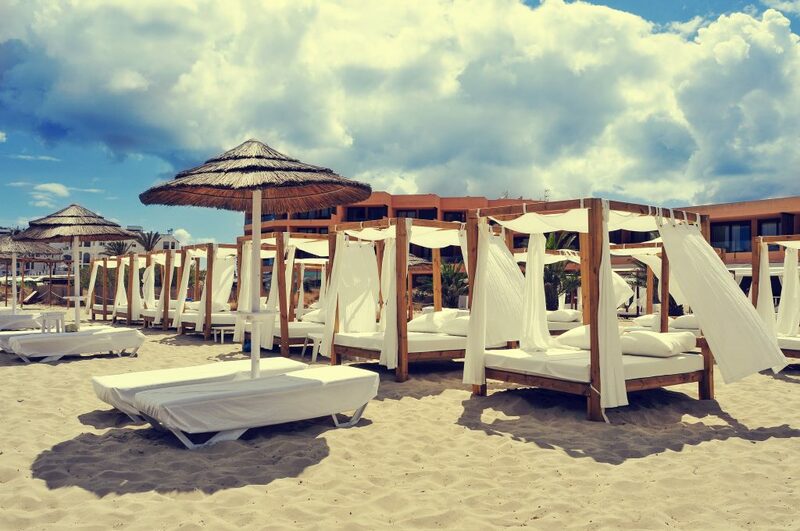 One of the trendiest beaches in Ibiza, celebrities are often spotted here enjoying the white sands and clear waters. The beach is part of the Ses Salines natural park, which is a protected area thanks to it’s high ecological value. There’s plenty to do on the beach and with your choice of trendy beach clubs, Ses Salines is a great place to spend an afternoon. This beach is located in Sant Josep de sa Talaia and features a rocky coastline, sand dunes and a somewhat hidden area for uhm, more natural beach going. Cala Conta is a favorite among returning visitors, and the Sunset Ashram bar overlooking the beach is where you’ll want to end the afternoon. 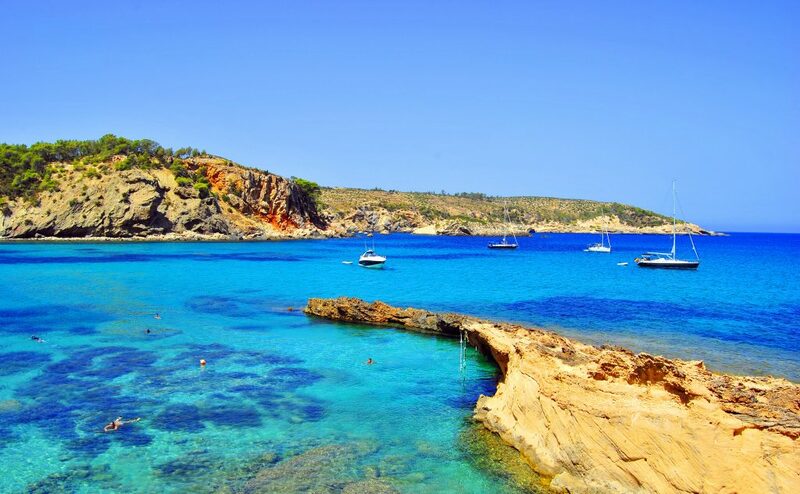 Located just 15 minutes from Ibiza town, this pebble beach is famous for its red cliffs and shallow waters. The Sa Caleta restaurant nearby serves up some of the best paella and white sangria on the island, and if you play your cards right, they’re set your table up and serve you on the water’s edge. Beat the crowds and get away from it all at this small cove on the northwest of the island. The tiny, horseshoe shaped bay is as small as it is peaceful, and the little haven is known for its snorkeling and relaxation. 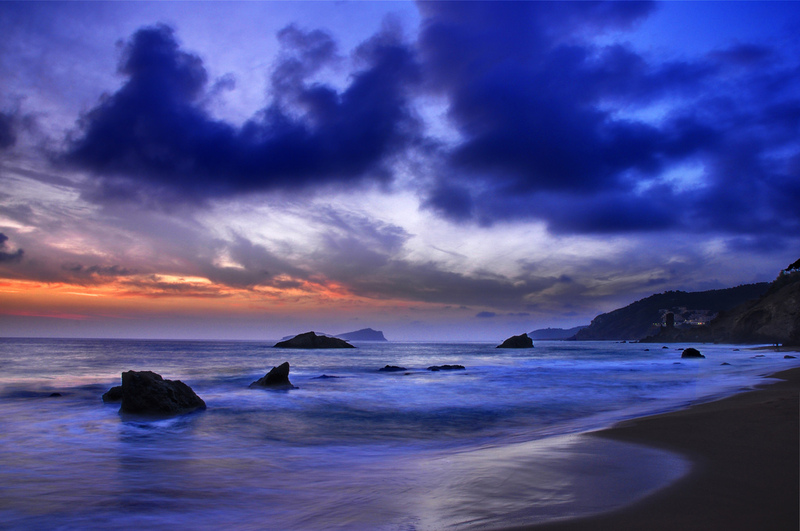 One of the most popular beaches on the island, the shores offer picturesque views of a rock formation known as Cap Bernat, or the Hand of God. The sheltered bay is a popular spot to anchor party yachts, and weekends are highlighted by local drumming groups as they beat down the sun. Located within reach of several other beaches, what San Antonio lacks in sand it makes up for with atmosphere. There are many beach bars lined up along the water to watch the sunset over the ocean. The waters here are shallow, safe, and great for youth swimmers and families. Boat trips are also available from the nearby harbor. Located on the north side of the island, this picturesque bay is know for its turquoise blue water surrounded by lush green pine forests and rocky pathways. It’s the p[lace to go for underwater lovers, with some of the best conditions for snorkeling and scuba diving. There’s also natural mud baths located around Cala Xarraca. Easily accessible by boat or bus from San Antonio, Cala Bassa is one of the busiest beaches in the Balearic’s during the summer. Rock pools and shady Sabina trees provide the perfect spot to cool off and relax before another night of electric boogie. Charter a private flight to an electric party scene and some of the best nightclubs in the world. From the best DJs in the world to avid music fans, Ibiza is a mecca for electronic music, but it also offers plenty of other activities to enjoy after your private flight. The island offers private luxury jet travelers everything from techno-fueled nightlife and incredibly popular nightclubs hosting the best electronic music in the world, to a variety of five-star hotels and resorts for luxury getaways, business trips and special events. The following list of our top choices was created based on factors such as ACA passenger feedback, location, amenities and online reviews. Once you arrive in Spain via luxury private jet, our Ibiza Jet Charter service brokers can also arrange ground transportation to/from the hotel of your choice. Ibiza is the place to catch the best DJs from around the world. Our team jet charter team specializes in arranging private jet charter flights to and from the island for live performances, music festivals, and other musical events. Whether you’re heading to the Balearic Islands to catch a show, or you’re a DJ who needs to arrange a private flight for a performance, our Ibiza Jet Charter team can connect you with the right aircraft for your flight. Ibiza’s party scene is second to none. The most exhilarating nightclubs in the world are located throughout the island, and the clubbing capital of the world offers several options to choose from. The world’s top DJs descend on the island every summer, and local nightclubs host events and parties throughout the year. The island is synonymous with EDM, and has played a major role in shaping the theatrics and performances that have turned electronic music festivals such as the Electric Daisy Carnival and Tomorrowland into some of the biggest music events in the world. Check out details below for some of the most popular night clubs on the island of Ibiza. Pacha is one of the oldest and most recognizable clubs on the island. Established in 1973 in a former farmhouse, the white-washed doors of Pacha house the crown jewel among Ibiza nightclubs. 2013 saw a major overhaul, and the San Antonio club holds parties hosted by Martin Solveig (My House – Wednesdays); ‘Paris by Night’ parties are thrown by Pacha favorite Bob Sinclar. David Guetta throws his notorious “F*** Me I’m Famous” parties starting in early June, and his last party every year closes out the club season with a literal and figurative bang. The biggest club in the world returns for 2016, starting the season on May 29th with its famous Privilege Opening Party. Privilege was famous for its Manumission parties for over a decade, and the club has recently featured residency nights hosted by Tiesto and Armin Van Buuren. 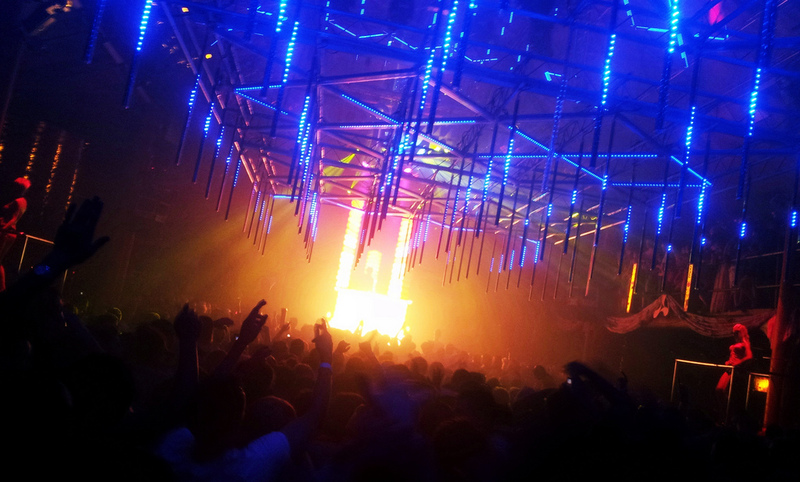 The size of the club is impressive; it’s large enough to fit the entirety of other Ibiza clubs within its dance floor. There’s a large swimming pool in the center of the club, and the Vista Club provides beautiful views of the sunrise to anyone still standing. SupermartXe returns as one of the more popular Spanish clubbing nights. Space Ibiza is the most awarded club in the world, winning Best Global Club in 2005, 2006, 2013 and 2013. The Playa d’en Bossa club offers five different rooms and a variety of parties that run nearly 24 hours. Carl Cox returns to Space this summer for his final year of residency at the club. The legendary DJ will host ‘Music is Revolution: The Final Chapter’ before hanging up his headphones, and his final 15 weeks are sure to feature some of the biggest parties on the island. Richie Hawtin and Luciano will also host parties this year for electronauts blasting off into orbit. Located opposite of Pacha is the renowned Amnesia, owned and operated by Cream. The two rooms of Amnesia – one a dark cavern and the other an expansive arena – provide a quintessential Ibiza experience to clubbers every summer. The club features everything from techno, house and trance to dubstep and live performances. 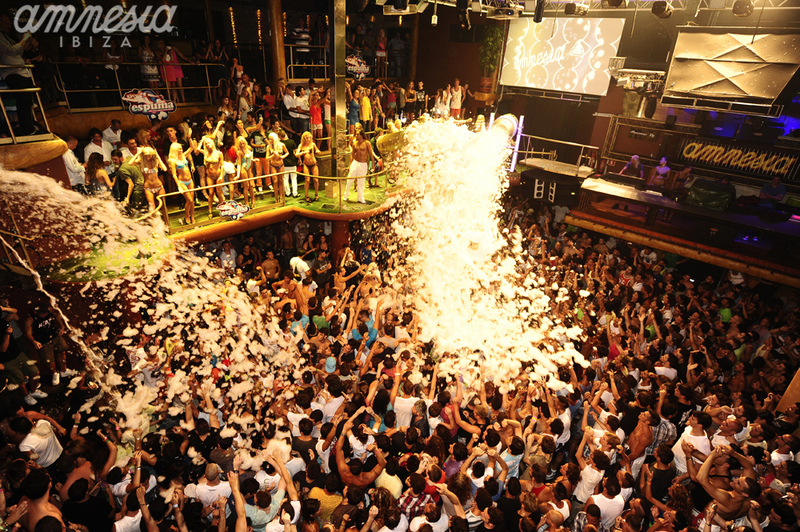 Popular parties at Amnesia are Cocoon, Cream, and the giant foam party, Espuma. Amnesia is one of the last clubs on the island to close, and DJs such as Laidback Luke, Fatboy Slim, Freddie le Grand and Eric Prydz have taken up residency here. It’s an experience you’re likely never to forget, unless your night results in the club’s namesake. Eden took a hiatus as the club Gatecrasher in 2014 after changing ownership, but last year saw many Ibizans return to Eden as it reclaimed its rightful place on the island, and it looks to thrill Adams and Eves again this summer with its renovated interior and incredible VOID soundsystem. Located directly across from Es Paradis, the proximity of these two clubs have kept both of them at the top of their games, and this year promises to be another epic battle between the San Antonio superclubs as Eden looks to take another a bite from the apple that is Es Paradis. The most famous sunset bar in the world, Café Mambo is home to some of the biggest pre-parties on the island. Mambo hosts epic pre-parties for San Antonio superclubs Pacha and Amnesia. DJs grace the decks of Cafe Mambo nearly every night, and you can grab a table for a meal or cocktail while the sun goes down – the beautiful sunsets seen from Mambo are not to be missed, and provides a serene contrast to the night of wild debauchery that lies ahead. East of Eden lies the apple of Ibiza’s eye, Es Paradis nightclub. Arguably the most beautiful club on the island, Es Paradis features a labyrinth garden interior and a pyramid shaped roof, serving as a rite of passage for Ibiza first-timers since the mid-70s. Its Fiesta Del Agua water parties are some of the most infamous events every summer, and the GLOW Neon Paint parties offer an experience you won’t find anywhere else in Ibiza. DC10 began life as an airport hanger at the end of Ibiza Airport’s runway in 1999 and has only taken off from there. This hedonist’s hideout is Ibiza’s most notorious underground venue, home to the wild and legendary Circo Loco parties held every Monday during the height of clubbing season. DC10 keeps a pretty low profile and doesn’t promote nearly as much as its larger counterparts, creating an atmosphere focused more on the music than crowd sizes. Ibiza isn’t just about nightclubs – Ibiza Rocks Hotel is known to throw some of the best rock concerts in the Mediterranean, Ultra takes over Space for their legendary opening and closing parties, and the International Music Summit is a gathering of some of the top professionals in electronic music to discuss the future of their industry. Check out more info below about concert and festivals in Ibiza. Originating in 1999 on the sands of South Beach, Ultra has grown into the world’s premier EDM festival, hosting massive festivals in Korea, South Africa, Croatia, Singapore, Japan, Brasil, Indonesia, Chile, and Argentina scheduled for this year. Ultra lands in Ibiza this May for the opening party at Space, and returns in October to collaborate with Space in throwing its epic closing party, one of the most anticipated events on the island. IMS Ibiza is a 3-day event that features seminars from the leaders in the international music scene. A series of interviews, classes and speeches are held to discuss the future of electronic music, evaluating everything from economics to theory. The IMS has also become a major factor regarding industry deals, press releases and worldwide media. The IMS Grand Finale Festival closes out the event at the UNESCO heritage site Dalt Vila. Electronic music isn’t the exclusive form of music found on the island, and DJs aren’t the exclusive performers, either – with as many European and Western travelers descending on the island, rock n’ roll shouldn’t be too far away. After all, Pink Floyd wrote a song titled “Ibiza Bar” for the soundtrack of the 1969 film “More”, which was filmed on the island. Ibiza Rocks Hotel introduced live rock to the island and is host to premier rock concerts and events, previously featuring acts such as MGMT, Florence And The Machine, Bloc Party and the Arctic Monkeys. Charter flights can arrive at the following airports in Spain and the Balearic Islands to arrange private jet charter service to/from Ibiza, Spain and neighboring areas. Clients flying private directly to Ibiza will arrive at Ibiza Airport (IATA: IBZ, ICAO: LEIB), the international airport serving the Balearic Islands of Ibiza and Formentera, located just 4 miles southwest of Ibiza Town. The airport originated in 1940 as a military base during the Spanish Civil War, and would go on to close following the war. It wouldn’t re-open until the late 1950s after the first waves of tourism crashed into the Balearic Islands; since then, the airport was been progressively expanded, with enhancements and renovations to runways, terminals and other facilitates. Today, Ibiza is a major European and Russian holiday destination, and (LEIB, IBZ) Ibiza Airport services more than 6 million passengers annually. Facilities include a single passenger terminals along with a 9,186 foot asphalt/concrete runway. There’s also 4 restaurants/cafes on-site: Sibarium Delicatessen offers gourmet products from Spain’s various regions; Medas Beer offers a variety of brews alongside tapas, sandwiches and rolls; there’s also two premium coffee shops, Illy Cafe and Caffriccio Coffe. Request a Quote or give us a call at 1-888-987-5387 to speak with one of our Ibiza Private Jet Charter agents to arrange a charter flight to one of the most luxurious, party-fueled destinations around the world!